This page is all about the Spanish Balearic Island of Menorca. If you are planning a holiday to Menorca we guide you on what to do and see during your stay with our complete tourist information guide. The biggest Balearic Island is Mallorca (Majorca), the island of Menorca is the second biggest and is much quieter. Here you can enjoy a relaxing holiday away from it all on what is regarded by many as the most beautiful Balearic Island. Certainly there are many pretty secluded coves and lovely sandy beaches to enjoy. 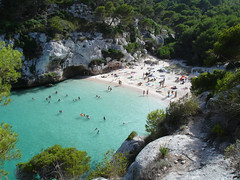 Menorca takes its name from the Latin word for ‘minor’ because it is smaller than the neighbouring island of Mallorca. This is why you often see Menorca also known as Minorca. It only has 268 square miles of surface area with a small population of just 95,000 residents although naturally that swells up in the peak summer months. Most tourist resorts are modern purpose-built and in the south of the island with good quality sandy beaches. In contrast the north of the island is more rugged terrain with small coves and bays. This surprisingly green island has a unique distinctive feature – the stone walls that farmers have used traditionally to divide the fields. You will also see a number of Bronze Age monuments made from these stones. These are known as navetes or tailaiots and are often seen as symbolising a boat turned upside down. 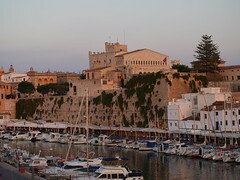 One of the attractions of Menorca (Minorca) is the ability to mix a relaxing beach holiday with a bit of history. The two biggest towns of Mahon and Ciudadela both have natural harbours and pretty squares with plenty of historic buildings to see. Although relatively quiet there are things to do at night in the form of entertainment, bars, pubs and nightclubs – see our Menorca nightlife page for more. Even if your accommodation is included in your package holiday do try eating out in one of the local restaurants at least once. Menorca has excellent seafood of course with freshly-caught squid, mullet, prawns, mussels and sea bass on the menus. The island’s speciality is Caldereta de Llagosta, a tasty lobster stew. Eating at lunch with one of the set menus (menu del dia) is usually excellent value with wine included in a three-course meal. The Xoriguer distillery produces gin which when mixed with lemonade, makes the Menorcan drink Pomada. You can see what Menorca loos like on the various Menorca webcams located around the island. Most beaches on Menorca are sandy with a few rocky or pebbled beaches and hidden coves. There are 46 sandy beaches most of which are relatively quiet and unspoilt which is ideal for families. The beaches are well-managed. On the main ones you will find lifeguards, Red Cross medical aid, toilets, bars, cafes and restaurants. Of course there are water sports such as scuba diving, windsurfing, fishing and sailing. For the active who find it hard to sit still on the beach, Menorca is known for cycling and you can also play tennis or go horse-riding. The longest beach with its 3km of white sand is at Son Bou, a popular resort. The famous Cala en Porter beach bordered by two large cliffs is not far away. 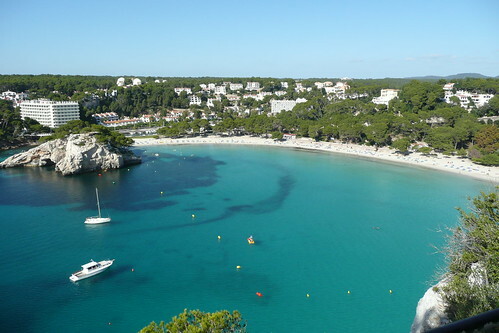 Other beach resorts are Calan Bosch and Cala Galdana on the south coast with S’Algar on the east coast. On the west coast is Cala’n Forcat while in the north is Arenal d’en Castell, a beautiful horseshoe bay not far from the nature reserve of Albufera d’es Grau. The international Aeropuerto de Menorca is 4.5 km south-west of the capital Mahon. From there the major autoroute ME-1 road divides the island going all the way to the opposite end where the former capital of Ciudadela is situated, also with its pretty harbour just like Mahon. You could just jump in a taxi directly outside the terminal or you can arrange an airport transfer service to your accommodation. There is good public transport with buses operated by the Transportes Menorca company. Car hire is also possible but note that the island is relatively small and can be easily explored using the bus service. We know Mahon as the capital of Menorca (Minorca) but you will see it named as Mao when on the island. Set in the east of the island, there is a pretty harbour here surrounded by cliffs. You can take boat trips from here to the small island of Illa d’en Colom in the bay. Mahon was occupied by the British from 1713 to 1783. As a result, many buildings remain with their distinctive Georgian architecture. Indeed it was the British who transferred the capital to Mahon from Cuidadela in 1722. The major sights worth seeing and exploring include the Town Hall (Casa Consistorial), Church of Santa Maria and the Church of San Francisco. The neo-classical and beautifully painted interior of the Church of Santa Maria is noteworthy. Many visitors come here to see and hear the huge 19th century organ which has around 3,000 pipes and was built in 1810 by the Swiss maker Johann Kyburz. Mahon’s old quarter is situated north-east of the Placa de s’Esplanada. A market is held here every Tuesday and Sunday and it is a gathering place for locals each evening. The Museum of Menorca displays ancient coins, maps, paintings and most notably the skeleton of a goat-like animal, Myotragus Balearicus, which became extinct with the arrival of man on Menorca. This is Menorca’s second-largest city with a population of 20,000. Once the capital of the island. it has plenty of charm and character with many historic buildings, a pretty harbour and the small beach of Cala des Degollador with the lovely promenade of Passeig Maritim. Ciudadela has been influenced by various rulers such as the Carthaginians, Romans and the Moors. In 1722 the occupying British forces switched the capital to Mahon thus sparking a rivalry between the two cities ever since. The Placa des Born is regarded as one of Spain’s most impressive squares rivalling those in Barcelona and Madrid. Here you will find the town hall and three palaces of Palau Torresaura, Palau Salort and Palau Vivo. The Torre de Sant Nicolau is a landmark watchtower built in the 17th century. The cathedral began in 1303 and took 75 years to finish. There is an excellent museum (Bastio de sa Font) which documents the town’s history. A short distance from Ciudadela is the Bronze Age burial chamber of Naveta des Turons which resembles an upturned boat and is the oldest roofed building in the whole of Spain. We have a Menorca map below showing the island and the major towns of Mahon and Ciudadela. The map naturally shows streets and roads so you can find your way around the island. It can also produce a route map with directions and timings. Switch to the Google Earth (satellite) view and you can zoom in and out and see images of what the island looks like from an aerial perspective. Menorca is part of the Balearics which are a relatively short distance from the eastern coast of Spain. This means they are not as warm in the winter as the Costa del Sol coast at the south of Spain and nowhere near as hot as the Canary Islands which are much further south towards Africa. You can see the latest weather conditions from these live Menorca webcams. As a summer holiday, Menorca is perfect. Temperatures in as early as May are warm enough to swim in the Mediterranean. In July and August you can expect daytime temperatures to be between 30 degrees and 35 degrees Celsius. Menorca is relatively flat but there is Mount Toro at 354 metres above sea level. As well as the sweeping views from the summit there is the 17th century Sanctuary of the Mare de Déu del Toro to explore. This is certainly not an island to come to play lots of golf but there is a 14-hole golf course at Son Parc. Families will enjoy a trip to the water park near Calan Bosch as a break from sunbathing on the beaches. The tourist offices are great for getting free maps and guides to the many tourist attractions and sights on the island. In particular they can help with your questions on topics such as finding accommodation and when the various local festivals (fiestas) are being held. Hello I know this is an unusual request. I am searching for a Manuel Alberto Fernandez Diequez who came to stay with our Family in Norwich twice many years ago. Our surname was the Gent and Alberto visited us when he was a young man. He would now be around 60 years of age . Any information would be more than welcome as I have no address at all. I would like to thank you for your very informative and nicely made site. Do you plan by chance to talk about La Gomera?